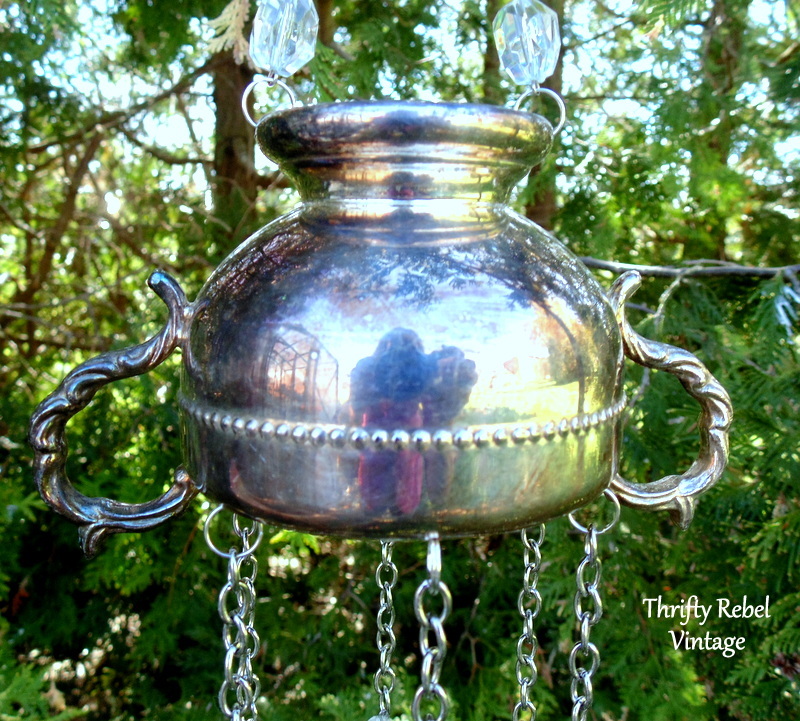 Sweet sounding silver sugar bowl wind chime. That’s quite the mouthful. We finally put our winter coats away and that means that wind chime making season is back!! Yay! 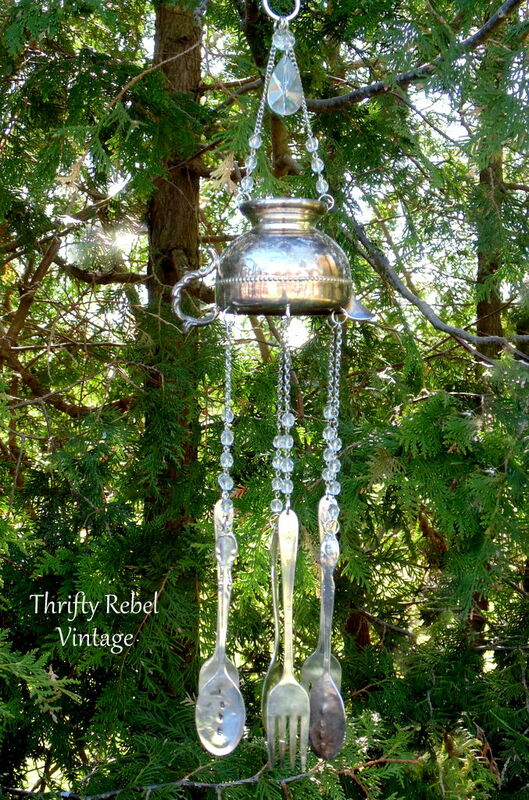 It’s fun to add some whimsy to our outdoor areas, and the sweet sound of a sugar bowl wind chime with hanging silverware tinkling in the breeze would be a lovely addition to any deck or patio. For me silverware makes the loveliest wind chime sound because it’s not too loud. It’s soft and pretty and won’t drown out the lovely singing birdies. 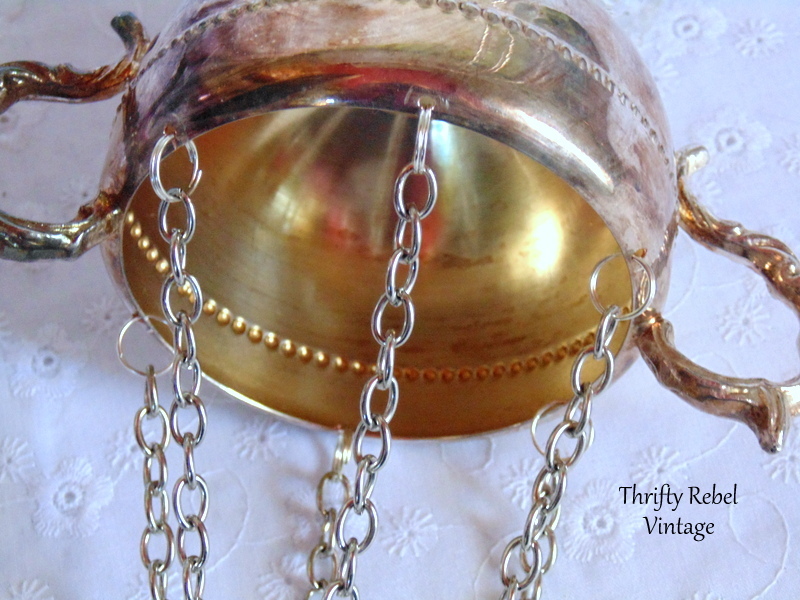 To make this chime you’ll need a silver sugar bowl, a thrifted necklace or two (or any chain will do), silver plate forks and spoons, some silver coloured split rings, and a drill with a 1/16″ metal drill bit. 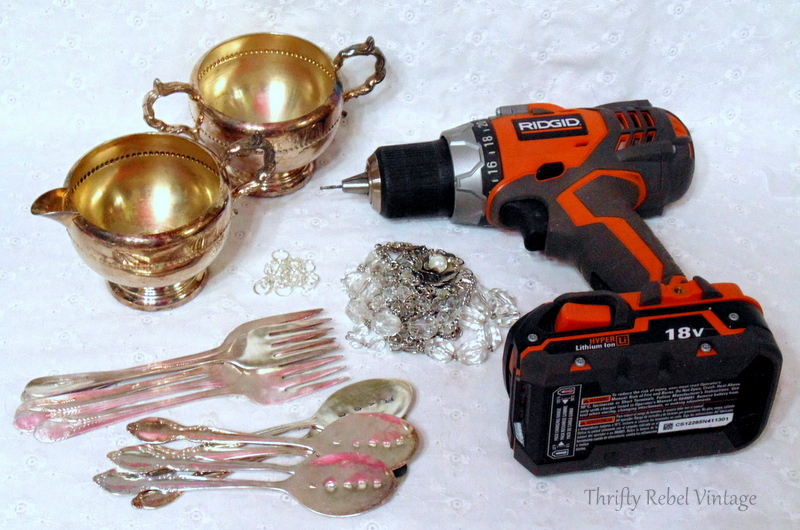 To check out how to flatten, hand stamp, and drill holes into silverware see my hand stamped spoon bookmark tutorial. 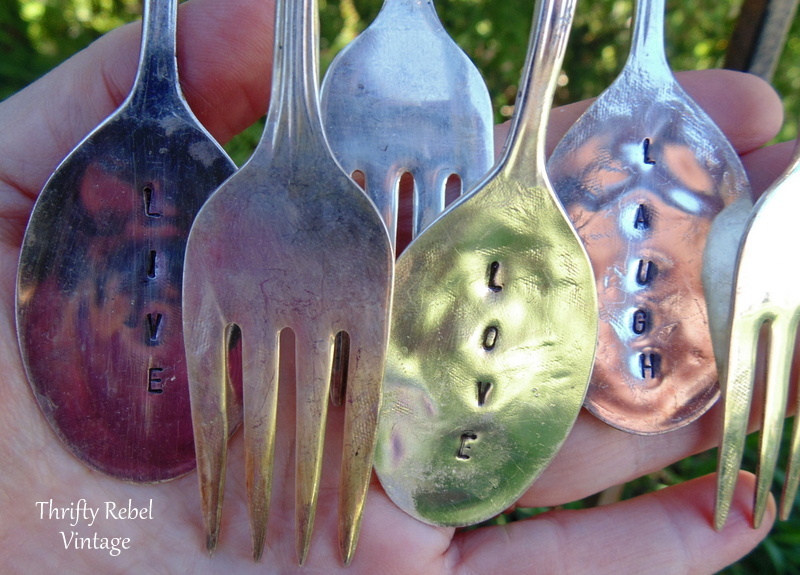 If you prefer to use un-flattened and un-stamped silverware it would still sound lovely… just not quite as bell-like. 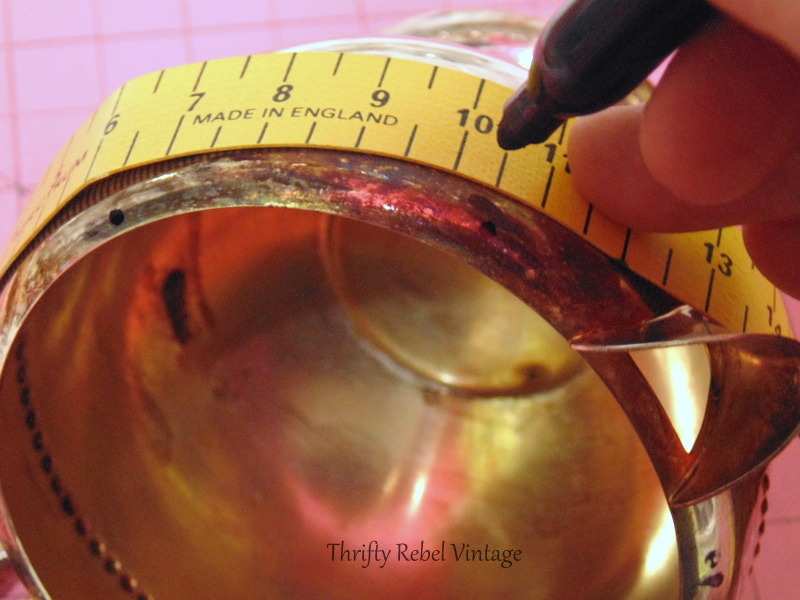 The first thing to do is measure around the sugar bowl and mark where you want your chimes to hang. They should be spaced apart equally. Now this depends how many forks and spoons you’re using. For my chime I’m using 3 of each. 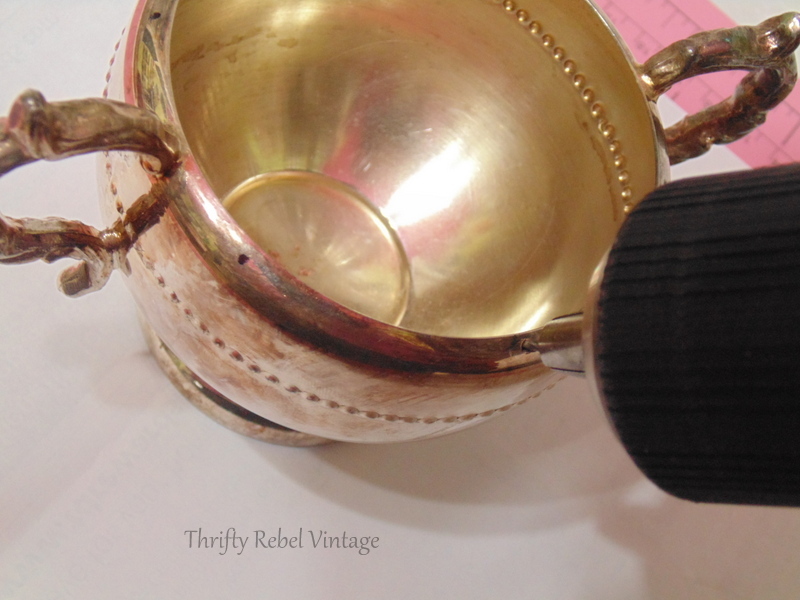 I don’t have a pic of this (it goes lost somewhere along the way), but you should also make two holes in the base of the sugar bowl for hanging the whole chime. Make sure to wear eye protection whenever drilling into metal. Take apart the thrifted necklace. 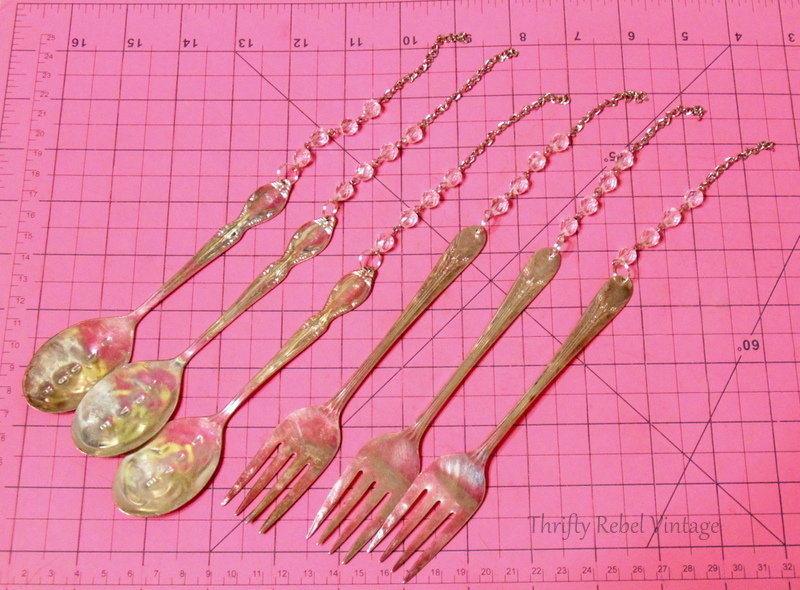 Attach the split rings to the spoons and forks through the holes, and then attach the necklace and chain to the split rings. These are for the creamer that matches the sugar bowl. 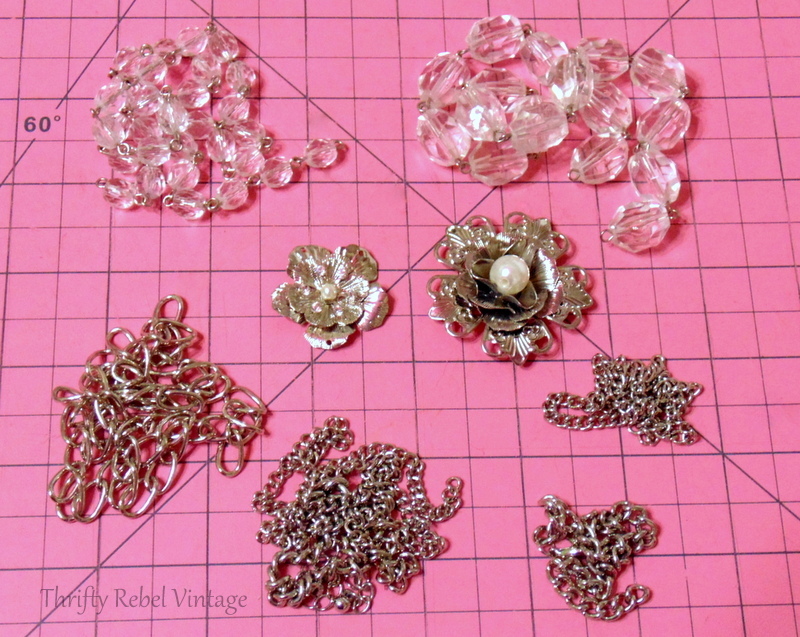 Then attach split rings to the other ends of the necklace or chain and attach through the holes in the sugar bowl. Do the same at the top. 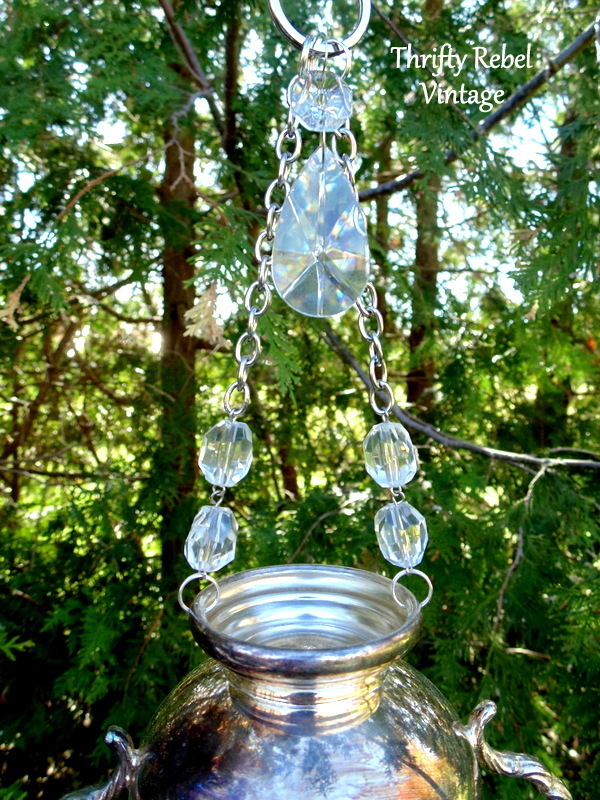 Attach the necklace or chain parts at the top to a key ring, and hang a lovely chandelier crystal to finish it off. Here are the two holes that I mentioned earlier, spaced equal distance apart for hanging. Split rings make attached everything together really easy. Windy days are great for listening to these chimes, but not so great for picture taking. I couldn’t get the chimes to stay still enough for a close up… so here you can see what they look like. … here’s the silver creamer. 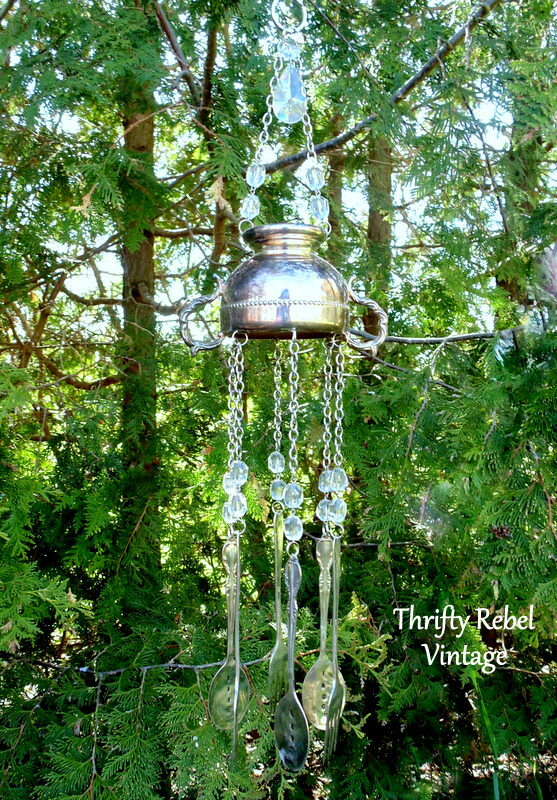 Making wind chimes is one of my favourite things to do, and by using different thrifted necklaces or chains you can make a one of a kind piece for your own garden or as a gift. 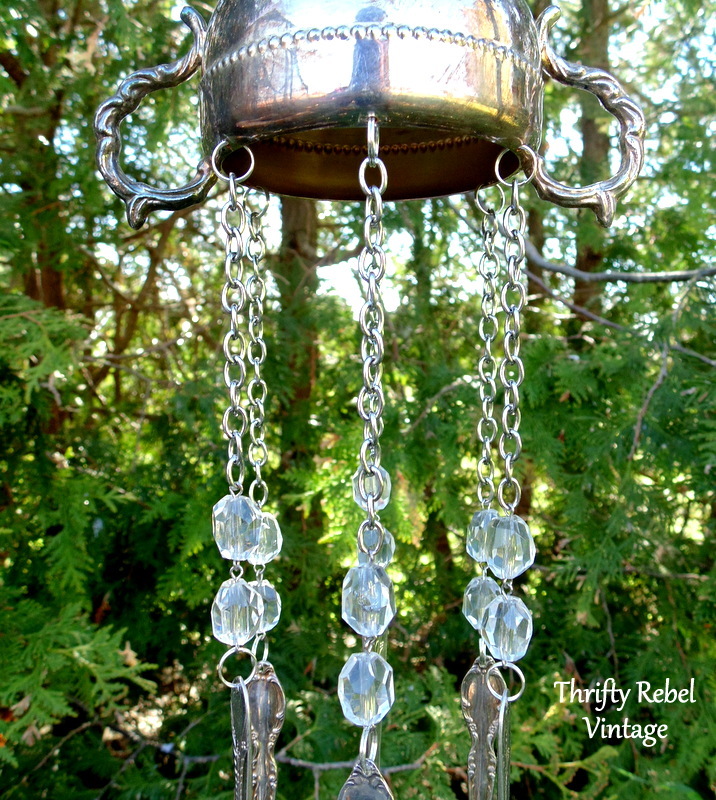 If you enjoyed this sugar bowl wind chime project you might enjoy my other diy wind chimes here. I am glad you love making these because I love seeing them. You make it look so easy to make. I may have to try because they do make great gifts. I tried the dish flowers and went crazy and made one for my girls and friends. Homemade is always so special. It is getting warmer here too and speaking of dish flowers, I can now put my lovely red one out! Yay, for getting our dish flowers out. Hopefully the cold weather is gone for good. I agree that homemade is special, and I enjoy making dish flowers and wind chimes for gifts too. Great job…looks good. I have wind chimes around my yard…love to hear the different sounds. Thanks Linda! I have a thing for wind chimes and I love to hear them on the back deck. I find the sound that silverware makes very relaxing. Good for you for getting at your craft room again Dona. 🙂 I can so relate to redoing things. Good luck with finishing it! This is adorable! Thank you for the wonderful instructions. Love them! I probably have most of the supplies to try one ….except for the split rings which of course is what makes it easy! where do you get yours? Thanks Linda! I usually buy from an ebay Seller located here in Ontario, but I just went there to check it out and she no longer has these in stock. I buy in bulk and I guess I’m going to have to find a new supplier. One of the dollar stores around here used to carry them so I could get some in a pinch if I was running low, but they don’t anymore. I’m probably going to try Amazon and see what I can find. I use 10mm split rings because any smaller I find them hard to deal with.